Rainwater collection has become an integral part of Seattle’s construction projects, starting with design and architecture, to be in compliance with the new 2016 stormwater and drainage codes. Collection and beneficial use can be key components toward compliance with these codes, which is especially important at the architectural design stage. Infiltration typically uses a detention system, which regulates and controls storm water runoff by slowing the rate of discharge to reduce impacts downstream, or a retention system, which stores stormwater runoff indefinitely, until it is lost through percolation, evaporation, or uptake by vegetation. Both are typical of rain gardens and small rain barrel systems. 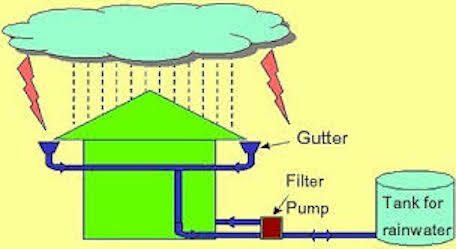 Rainwater collection systems typically collect only roof runoff and conveys it to storage for future beneficial use. This can be for irrigation by combining detention and collection. Some Rainwise Program installations are combining these two in their approach toward best practices of stormwater management. Larger scale rainwater collection systems are typically comprised of corrugated steel water tanks used for irrigation, water closets, and wash down and can be included in the building’s design. RainBank Rainwater Systems works closely with owners, architects, engineers, and contractors in the process of design, through installation, to achieve the desired results of both efficiency and aesthetic. RainBank is a full service rainwater collection systems contracting company offering designs, permitting and construction throughout Washington State and Oregon. New codes and permitting can be complex and sometimes frustrating, especially when the rules change. We remove the guesswork of all requirements of city, county, and state agencies and new codes. All designs are custom engineered to meet specific design requirements while onsite management and installations are by ARCSA accredited installers and licensed plumbers. We only specify and install the most reliable, effective components and warranty our craftsmanship. 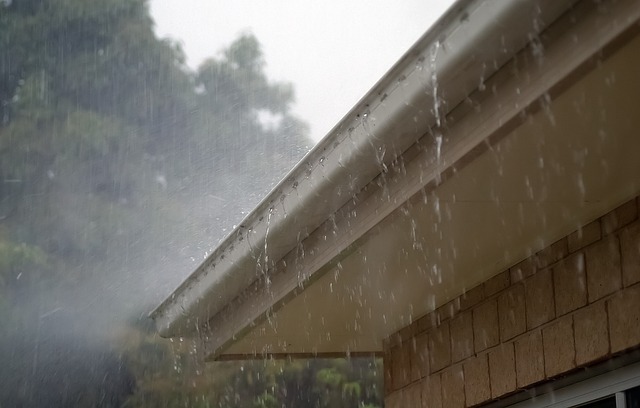 Why is Rainwater Collection Important? 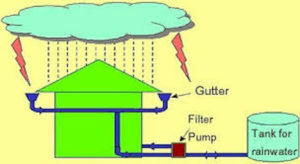 Simply put, Rainwater Collection is the practice of collecting and storing rain for future use. A Rainwater collection system combines components to collect, convey, and store for beneficial use. This can be as simple as rain barrels or a more complex system for potable drinking water. Both are important and have large scale benefits environmentally and socially. The use of rainwater collection, or sometimes referred to as harvesting, is nothing new. Evidence as far back as 1700 BC on the Island of Crete indicate a sophisticated rainwater collection system. It is known that the Romans constructed reservoirs and conveyance throughout the Mediterranean. In more modern times, many of our grandparents collected rainwater in rural areas in the United States and Europe. During World War II, many of the South Pacific Islands occupied by US forces collected rainwater for beneficial use. A modern, centralized water system in urban areas expanded into outlying areas and eventually into more rural communities. Large and small public and community water systems made life easier for the average person and costs were minimal to the consumer. However, with increased demands from population, commercial and industrial demands, new fresh water supplies are becoming strained. The technology, equipment, testing, and efficiencies of rainwater collection and a supplementary, decentralized water system are helping to reduce that stress on today’s resources. Expenses incurred to upgrade, expand, and repair our current centralized water systems will be high, but can be reduced by lessening the demand. The use of rainwater capture for non potable use, i.e., toilet and laundry facility, can reduce residential use by as much as 48%. The use of centralized water, disinfected to drinking water standards for irrigation of landscaping has a great impact on our resources. Along with better practices such as swales, drought tolerant plantings, passive on sight infiltration, pollution of our waterways are less threatened by stormwater runoff. Groundwater levels at present are showing declines, excessive pumping, and other factors are causing wells to go dry or quality to decrease. Many locals are experiencing shifts in rainfall frequency and intensity. Declining habitat due to impacts of development, pollution from runoff, and declining river flow rates can be minimized by preventable, best practices such as rainwater collection, use, and infiltration. 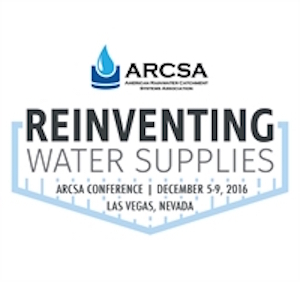 Contain Water Systems Inc . and RainBank Rainwater Systems will be at the16th annual American Rainwater Catchment Systems (ARCSA) conference in Las Vegas December 4th through the 8th. Come talk with us at the Contain Water Systems Inc. booth during the trade show on the 7th & 8th. Or, use the form below to contact Ken Blair, president of RainBank Rainwater Systems to set up a meeting anytime during the conference. He will be happy to sit down with you and discuss the advantages of choosing Contain Tanks, distributed by RainBank Rainwater Systems. RainBank’s Engineering Department Leader, Chad Lindsly will be attending the conference as well to answer questions about RainBank Rainwater Systems’ engineered rainwater systems. RainBank Rainwater Systems offers a progressive, sustainable approach to rainwater collection. RainBank Rainwater Systems has over 15 years experience in the industry with commercial, and residential design builds featuring steel tank construction, potable and non potable systems. 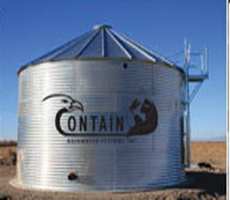 Contain Water Systems Inc. with their through the liner access panel, 20 year warranty, and competitive pricing, make a RainBank/ Contain tank purchase a solid choice. Both Contain and RainBank share the commitment of “making relationships as strong as steel”.